The long-awaited reprinting of Virginia’s “GOALS FOR ME” poster is complete! This first of Virginia’s posters was originally designed and produced by Celestial Arts in 1973 and is a lovingly digitally re-mastered reproduction of the original. 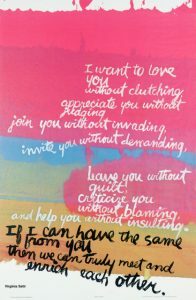 This provides her answer to the question of how to make loving, appreciating, joining, inviting, leaving and criticizing one another a truly enriching experience.